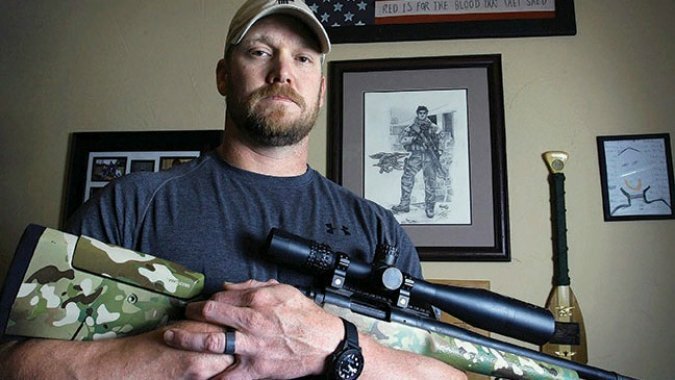 Chris Kyle had more “kills” than anyone in US Military history, a fact that accords him ‘Legend’ status amongst his fellow warriors but also comes at a cost. Bradley Cooper (American Hustle) perfectly portrays ‘Kyle’ as a duty honored killing machine uncomfortable with his ‘celebrity’ who struggles being home and reconnecting with his family after multiple tours of Iraq. The opening scene of the movie is gripping as we see ‘Kyle’ on a rooftop in Fallujah having to make decisions no human would ever want, balancing the lives of the Marines he is duty bound to protect and the survival of his own humanity which is continually battered by these life and death calls. 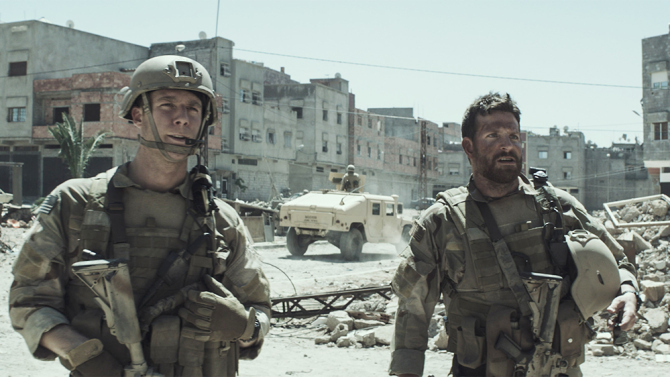 The Tanzania Embassy bombings and 9/11 are drivers for Kyle through Navy Seal training and eventual deployment into a war that Clint Eastwood as director doesn’t bombard us with judgments, instead letting Kyle’s story take shape. Sienna Miller (Foxcatcher) plays Kyle’s wife Taya, who initially is wary of soldiers and their flaws, only for Kyle to win her over. An early scene between these characters when they first meet in a bar is brilliant. I haven’t seen Miller in other movies but she does a great job here as the wife of a returning soldier dealing with PTSD. She is trying to hold her family together as Kyle drifts in and out of their marriage emotionally and physically. 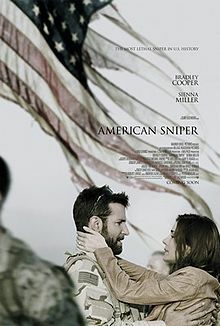 This movie is based on Chris Kyle’s autobiography ‘American Sniper’ and chronicles his four tours of Iraq and the aftermath. We see battle scenes that are some of the best since ‘Saving Private Ryan’; the helicopter gunships sequence is truly epic. Upon its release in America it divided opinion along the left and right Political landscape, at the same time earning six Oscar nominations. It also brought huge numbers through the box office, racking up just over half a billion dollars worldwide whilst in theatres. Moral judgments aside this movie is Bradley Coopers from start to finish. I remember him back in the ‘Alias’ days with Jennifer Garner and his career since then has gone from strength to strength. This could well be his finest performance. He plays this role with such a deft touch that’s understated most of the time but when you see the unraveling start to take shape Cooper doesn’t overplay it. I’ve seen interviews where Kyle’s family members heap praise on Cooper for how perfectly he captured the essence of Kyle and poured himself into the role. Regardless of weather you agree with the Iraq war and the reasons behind it this is Clint Eastwood’s best movie in years and whatever your take is on Chris Kyle, his story is fascinating.